Edict is the flagship project and intellectual property of the Electronic Dictionary Research and Development Group, under the fearless leadership of Prof. Jim Breen, at Monash University in Australia (copyright and license terms). It's a Japanese-to-English dictionary with about 125,000 entries, as of early 2007. 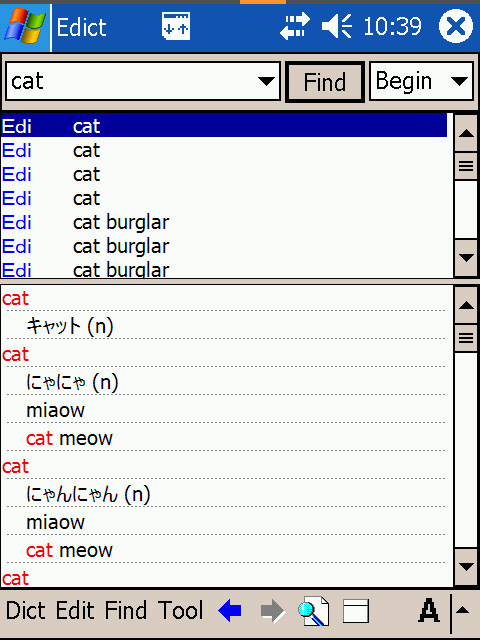 Most Japanese software resources and dictionaries you'll find are based on Edict, and with good reason. It's a superb resource. 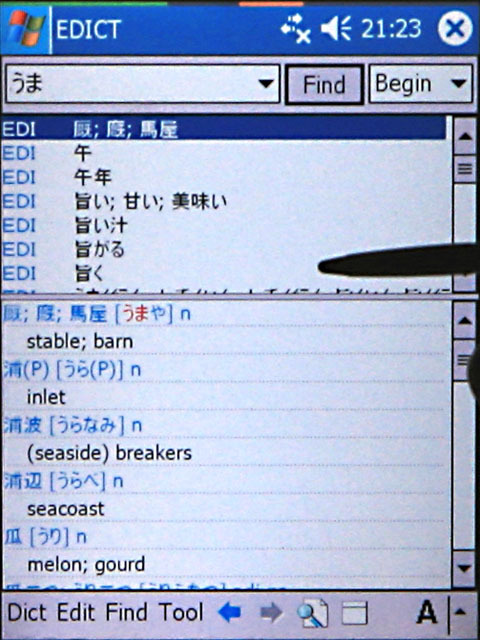 Edict has about as many entries as the standard commercial dictionaries you'd find in Canon Wordtanks and the like, but because every Japanese entry can be found by searching for kanji or kana, it's a lot more useful for the non-Japanese. 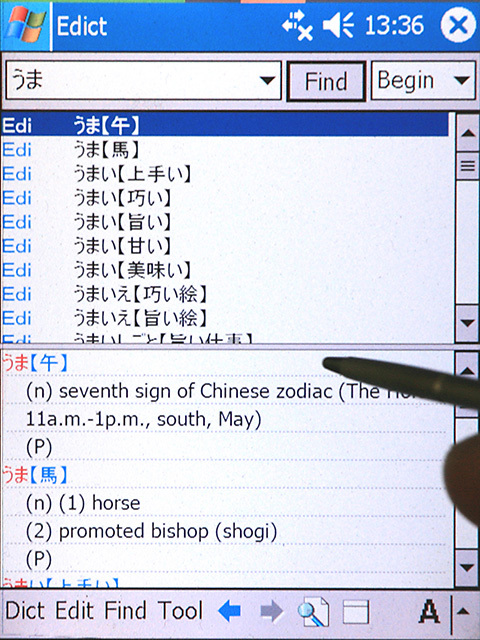 I've optimized Edict for all kinds of searches--kanji, kana, and English (not romaji!). Because of that, my adaptation of Edict is much more useful than any other I've seen. Here are some typical screenshots of the EPWING version (the results look pretty much the same in PDIC)--note that the actual PDA display is much sharper and easier to read (see below). You can click below each image to see the actual 480x640 pixels of a VGA PDA display. Compare the actual search results with those from Hloeffler's version of Edict, which seems to be typical of the versions I've seen on the web. Because of the way the entries are ordered, the list of results is in alphabetical order (either by kana, kanji, or English, depending on how you entered the search). This makes it easy to scroll down to find similar or related terms. Most dictionary programs search from the beginning of the definition to find the word; here, if you searched for "far," "apart," "remote," or "different," you wouldn't find this word. You'd have to search for "to be very" or "to be quite"--starting from the "to." I spent hundreds of hours working on Edict to ensure that it gives the best results possible when you look up an English word. While it's easy to move "to" or "to be" to the end of the entry above, that'd still leave "quite" and "very" as index terms, and if you were looking for a Japanese word with this sort of meaning, you wouldn't think to begin your search with "quite" or "very." But at the same time, I can't get rid of "quite" or "very" at the beginning of every entry because sometimes those WILL be the key words. As you can imagine, editing 125,000 entries to give the best results is a time-consuming, complicated task. Some dictionary programs work differently and search the entire text of Edict to find the word you searched for; however, that word probably comes up incidentally in quite a few entries. 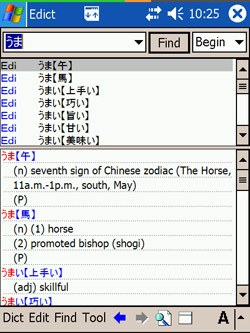 For example, search for "horse" in PAdict, an otherwise excellent application that I recommend highly for Palm OS PDAs and smartphones, and you'll have to scroll through screen after screen of obviously inappropriate results before you get to the plain and simple word for "horse," "馬【うま】." Wading through so many false results is time consuming and makes it hard to find what you're really looking for. Using a program like this on Eijiro, with about 15 times as many entries as Edict, would be a disaster. 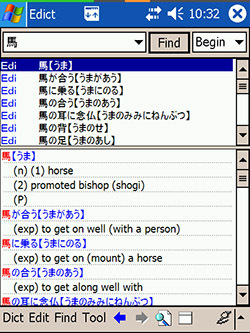 Edict was originally made as J-toE dictionary only: each entry was a Japanese word, followed by a list of possible English translations. As I said above, I did quite a bit of work to optimize it for E-to-J searches as well, but the structure may seem a bit odd. If you look up an English word, you'll see that English word first, followed by the Japanese word on the next line, followed by more English words. These other English words, after the Japanese word, are other translations of that Japanese word. The Edict entries tend be pretty terse, but you can look at these other translations to get an idea of the true flavor of the Japanese word. Thus if you enter the word "creep," you'll find several different Japanese verbs with that meaning. By looking at the other English translations of each of those, you'll see that しのびよる has more the sense of "sneak up on," connoting stealth and deception, whereas はいずる just means "crawl," describing more the type of motion. I've designed my Edict so that the direct translation of the word you're searching for will come up first, followed by related and more specific terms. Often, by taking a second to browse down the results, you can find a term that exactly matches what you want to say, even if you'd entered something fairly general like "different." It allows you both to find what you want fast, and to find new (perhaps the perfect) word when you can take a few more seconds to browse. I've also grouped some terms by category: enter "sumo" and, after the entries beginning with the word "sumo," you'll find all the specialized sumo vocabulary in Edict, laid out together for your browsing pleasure. I've done the same for baseball, Buddhism, keigo, and computer terms. Because of the unique nature of Edict, I found that the results list was easier to scan if the yomigana (for kanji searches) or kanji (for hiragana searches) were indexed along with the keyword. Because of this, "Exact" or "End" result searches will come up empty. Instead, search for entries beginning with the search term (choose "Begin" in the search type window to the right of the "Find" button). You can always search for the search term anywhere in the entire text of Edict ("Full"), but that takes much longer. You'll probably just leave the type set permanently to "Begin" anyway, so this isn't something you have to set for each search. 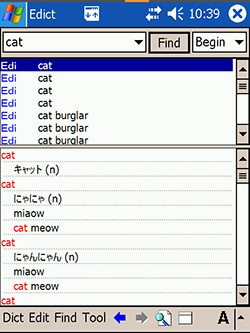 Finally, I recommend that you install the Conjugations dictionary along with Edict. Then, to find out how to conjugate any verb in Edict, simply select the verb, hold the cursor down (EB Pocket) or right-click (EB Win on a regular computer) to bring up the pop-up menu, choose "Search specific dictionary," and choose Conjugations. Use the Back arrow at the bottom of the screen to return to the Edict entry when you're done. Note that "vs" verbs are really just nouns followed by the verb "suru," so to find the conjugation for something listed as "vs" in Edict, just look up "する" in Conjugations and slap the appropriate form onto the end of what you see in Edict. That's already much more than you need to know to use EDICT, but if you want to get into the fine points, see the general instructions for all dictionaries. Download my version of Edict: EPWING, PDIC.